This entry was posted in Economic History, Politics and tagged 2012, dollar collapse, economic crises, financial crises, interest rate spike, paul krugman, peter schiff, third world countries. Bookmark the permalink. read joe weisenthal much?! he linked to the same article this morning on twitter. and my comment remains, we’re facing a different problem today, hence a different solution. balance budgets when times are good (or even save a surplus), spend when there is a lack of demand. Not exactly. The real problem today in my eyes is debt saturation, which is absolutely an output of firstly budget deficits and less directly trade deficits. I agree with Reinhart and Rogoff’s interpretation — countries can’t generate organic growth or much demand if there is huge residual debt overhang. 2/ Next time we get a liquidity shock we let the system fail, bail out account holders, and recapitalise the stronger banks with lower debt/derivatives exposures that do not fall with the system. 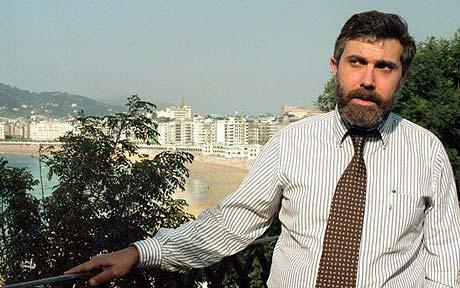 I think Krugman is more a Democrat than an economist – to him Bush’s deficit is warning but Obama’s is good for the economy. Krugman correctly recognises that Bush’s deficits were funding huge destructive wars, with little material value to the economy other than raised demand. Krugman also instinctually believes that Obama’s deficits will be funding more “productive” things, and that the additional demand is helpful particularly in what he calls the Lesser Depression. I for one have not seen much evidence that Obama’s deficits are any less corrosive than Bush’s. America is becoming more dependent on Chinese goods, shipping more of its productive capital and labour off to service its empire, and its financial system is still extremely fragile. Unemployment is still elevated, and industrial output is even lower. bush overspent when times were good and economy was roaring, hence no need for a deficit because there was demand. now, there is no deman, because as the op noted there is a debt overhang. consumer spending is 70% of gdp. over-leveraged consumers cannot afford to spend. i would argue there is a difference between public and private sector debt though. excess private will inhibit growth, i’m less sure about public. If over-leveraged consumers cannot afford to spend, then how can over-leveraged government? The two options are raising taxes (not politically feasible in a Depression) and acquiring more debt at very low interest rates, which seems attractive (because interest rates are low today), but as Krugman notes in the article eventually we’ll have a Wile E. Coyote moment when institutions and governments are sick of the negative real rates they are currently getting on US debt. Negative real rates are very dangerous, because while they do have some positive effect on demand, there is always a danger that a negative reaction by debt holders can cause rates to spike uncontrollably. That’s your Wile E. Coyote moment. gov’s and household’s finances are very different. this has been well krugmanned. the external debt relationship is symbiotic. china cannot have growth without a cheap yuan, which binds it to buying treauries. yes, this cannot go on forever, but certainly for now, at the rates the us gov can borrow at and with the complete absence of consumer demand and with the overleveraged consumer, the gov has to step in. austerity doesn’t work, ask greece. And the solutions that I suggested above (partial debt jubilee) are not politically feasible. So that means we will continue to inflate our way out until we hit the Wile E. Coyote moment (loss of faith in dollar) which could be five years or six months away. I for one don’t think China needs to keep buying treasuries. For a start they have reduced their treasury exposure recently (as have Russia), and more importantly they have now acquired so many dollars that they can just recycle them on developing domestic consumption. I am often to blogging and i really recognize your content. The article has really peaks my interest. I am going to bookmark your website and preserve checking for brand spanking new information.